Recently in red carpet style, we were treated to the country music gem that is the Academy of Country Music Awards, a fun-filled show located in the equally fun-filled city of Las Vegas. And because it’s Vegas, there had to be some serious glitz on the red carpet. One of the great things about country music’s red carpet style is that you can never have too much. One country starlet who took this mantra to heart was nominee Jana Kramer, who knocked it out in a showstopping Badgley Mischka gown. There is a whole lot going on with this dress, but Jana makes it work to her advantage. From the gold color to the sparkle to the fringe to the tulle at the bottom, every single spot on this gown has a wow factor. Even though there is so much detailing and embellishment on the dress, each element works in its own way to keep the look cohesive. Because this gown is such a huge statement, Jana wisely kept her accessories simple, adding only a small pair of diamond studs and her appropriately sparkly engagement ring. She also kept her makeup and hair fuss-free, allowing the dress to truly shine. For everyday wear, one statement piece is usually enough, especially for daytime. 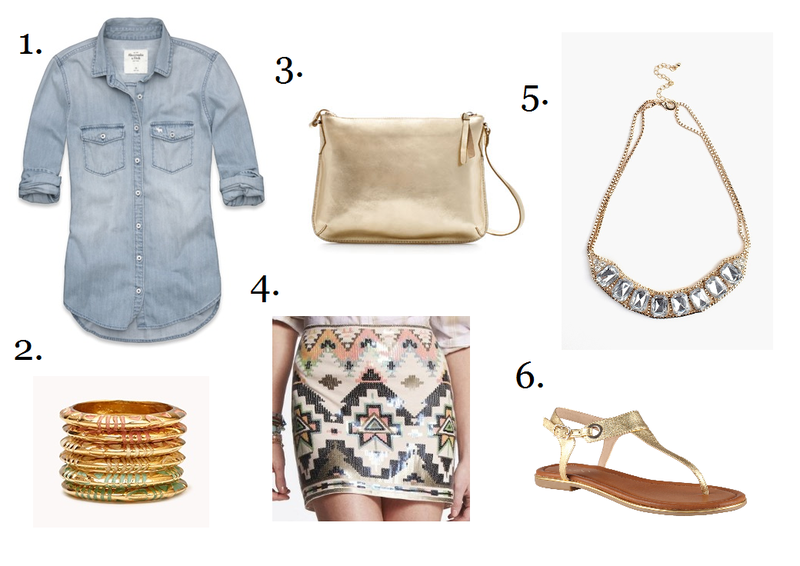 With this outfit, a sequin skirt in a trendy Aztec print will definitely do the trick. The color of the skirt is a nod to the gold of Jana’s gown and its print recalls the embellished pattern of the dress. This dramatic piece can be downplayed for day with a casual denim shirt, a great piece that can be worn in a variety of ways. Accessories-wise for this look, it’s going to be gold all the way, starting with a simple gold bag that keeps the shimmer going, but not in an over-the-top way. A gold and rhinestone statement necklace adds some more drama to this look, but it’s just small enough that it doesn’t take away from the statement of the skirt. Instead of big wow factors like Jana’s gown had, little ones are enough to keep this outfit looking super sparkly while also keeping things clean. Add a few more gold accessories, like these fun printed stackable rings and maybe a bracelet or two, and you’ll be golden like Jana in no time! With this much shine, makeup should be kept pretty neutral, so opt for a clean face with a hint of golden eyeshadow and a slick swipe of gloss to add some shine.